I am a passionate student & theoretical researcher focusing my attention on the ethereally complex field of Neuroscience, established by the infamous Spanish conquistador of anatomical biology: Santiago Ramon y Cajal (1852-1934). Cajal left behind a fluid and oscillatory paradigm that continues to redefine itself with each passing year. Much to the disdain of other researchers in my field, I do not believe one single linear & notional paradigm will be the end all for our ever growing collection of unanswered questions. I am never against the acquisition of knowledge and revel in the fact that others have interests in more specific sub-sets of Neuroscience, such as the beautiful array of neurons in the retina, or the neurons that comprise the fulcrum of the hippocampus. I am convicted that there are multiple paradigms for each particular functional aspect in the physiological dynamics of a mammalian nervous system. 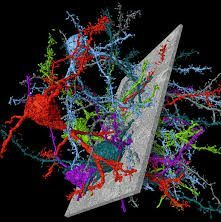 And Thus we should focus our efforts into two compartmentalized areas of Neuroscience: attempt to establish an accurate representation of the spatial and cellular function of all neurons. I would also like to commend another father of the field, Sebastian Seung, Author of “Connectome: how the Brains wiring makes us who we are“. Sebastian brought to us the theorems of Connectomics, a rather boisterous proposal that has proven to be exceptionally interesting in terms of data mining neural chains. Researchers have long known that the threshold potentials of neurons play a very important role in the activity of neuronal chains- Sebastian wires the paradigm together concluding that these activity paths are also exceptionally important to chart and comprehend. I hope that in the coming decades we will delve deeper into uncharted neuronal informatics & gain insight for the betterment of science & humanity. The best way to accomplish these goals is to inspire the population of undergrad scientists as they are the stock of our future. This Blog will focus on the current events of the Connectomic theorem & also its comparatively disparate field of study- the stricter & concrete physiological life of neurons. I will be establishing a foothold on topics by posting links and the apparent Abstracts from various projects published on accredited journals. Subsequently I will be giving a detailed & concise summation of the topics discussed, project limitations, data, novel information, conclusions..etc. I hope you will enjoy the enlightening world of Neurobiology & its seemingly unending streams of riddles.